In Giles County you need to add the Town of Narrows to your riding destination list. The Town is situated along Route 460, at the junction of Route 61, the newly designated Twin Depots Scenic Trail. There you will also find access to the New River, Mill Creek, and Wolf Creek. This charming town is home to an historic hotel, The MacArthur Inn, the county’s only brewing company, Right Turn, Clyde Brewing, and a local deli, the Blue Moon Café. Narrows is naturally beautiful and a natural place to stay, shop, and serve as base camp for your ride. In the fall the roadways and surrounding mountains burst with colors enticing you to explore this small Americana hometown. Right Turn Clyde often hosts food trucks out front of their establishment, or you can grab a quick bite at the Blue Moon Café. Resting at the Town Park or by the Duck Pond to listen to the sound of Wolf Creek tumbling onto the New, heightens the connection with your surroundings. Route 61 is a vehicle traffic road but sits on the route of an old railroad. This makes the Bluefield Century Loop one of the flattest and fasted in the region. The 100.8 mile century loop starts at the Narrows Town Park. There is parking, open restrooms, even a playground and swimming hole in Wolf Creek. Enjoy shade under sycamore trees and picnic beside sweetgum saplings. Traveling down Route 61 on the last part of your trip, you ride alongside Wolf Creek on a gentle slope. The entire loop has rolling hills with one long climb. Historical tidbit, at approximately mile 92 on Route 61 on a side road running parallel, you will find marked graves of the first white settlers in the region. Another worthy road route is the Elgood Loop. Also starting at the Narrow Town Park off of Monroe Street, just past the downtown business district, this 44.5 mile loop takes the rider west towards Glen Lyn and the West Virginia line. 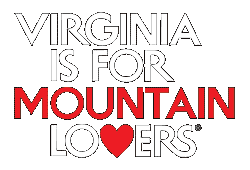 The terrain is explained as ‘long, steep climbs, and switchbacks’ by the New River Valley Bicycle Association. In Glen Lyn, approximately eight miles away, a new trail system at the Town Park and Campground offers riders plenty of options. There is a convenience store and gas station nearby to refuel and head onto the campground which also borders the New River Water Trail. The Moore Trail is a 4.5 mile paved trail around the open grounds of the park. The newly established Mary Ingles Trail (the MIT) follows the New River downstream for approximately 7 miles before entering into West Virginia. This out and back off-road trail is flat and well maintained. This is one of the few places you can bike alongside New River in a totally undeveloped area. Riders won’t see cars, trains, or electrical lines. They might pass another trail user or see a raft of fishermen floating on the waterway. Coming back into Narrows, the mountain biking enthusiast can’t miss one of the best trail systems in the region. ‘Up Mill Creek’ as many say, riders will find over 20 miles of trails, plus three waterfalls, and a native trout stream. The Mill Creek Nature Park can be found by turning onto Route 100 in Narrows, then turning onto Northview Street. Traveling to the end of the road, pull into the dirt road and large parking area. From here you can review a map of the property and trails or download one before from the Town of Narrows website. The area has a picnic pavilion and open space to enjoy. Historical tidbit, one of the oldest engineered structures in the region is the dam on Mill Creek at the Appalachian Spur Trail and shelter, a short walk from the parking area. Fall foliage and wildlife abound in the woods and grassy field at Mill Creek. 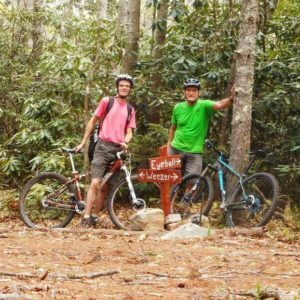 Mountain bikers will find tight single track and accessible double track, with options in-between at this property that is free and open to the public. This area, much like what you will find in the region has no shortage of mountain views, tumbling streams, and vistas to enjoy. Mill Creek Nature Park does have some steep and technical trails that are identified on the map, but worth the attempt. Just under 19 miles away, mountain bikers can also enjoy the Mountain Lake Wilderness and the off-road action in this vast wilderness area. Visitors to this area can purchase a parking pass and connect with the Mountain Lake Outfitters for maps and suggested routes. This area has over 22 miles of trails throughout the 2,600 acre Wilderness. While at Mountain Lake enjoy Stoney Creek Tavern or Harvest Restaurant. The Mountain Lake Outfitters has rentals available, expanding beyond mountain bikes to include, disc golf equipment and orienteering equipment. Historical tidbit, the film Dirty Dancing was filmed at Mountain Lake 30 years ago. Giles County is home to multiple spring cycling events that may entice you to come and play. 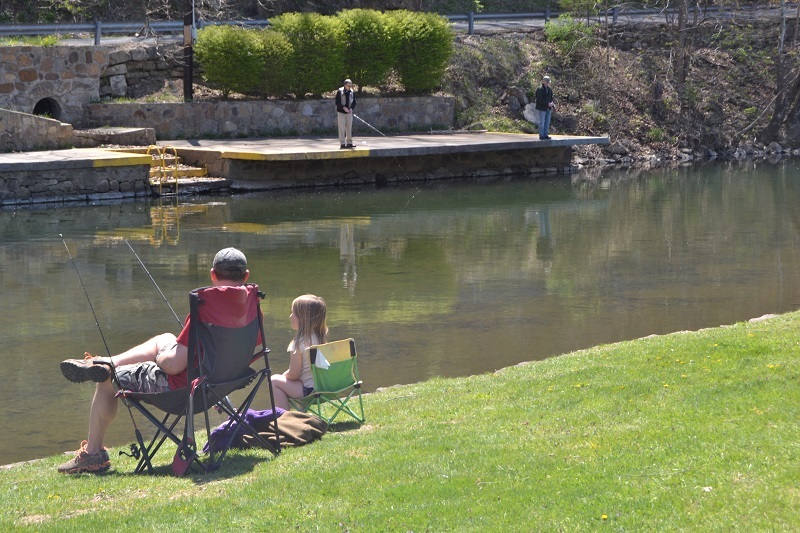 The Spring Up Wolf Creek is hosted by the Narrows Lions Club and is held every spring. The ride is an out and back and follows the Twin Depots Scenic Trail, also known as Route 61. Total distance is 42 miles of flat, flat, flat beautiful spring surroundings. This annual event is great for all riders, families included. The Mountains of Misery bike ride event is a challenging, timed event starting and ending at the Newport Recreation Center on the eastern side of the county. This popular century and double century ride sells out fast and is always a popular late spring event. Take time to enjoy Giles County and the many parks and scenic roadways. The five charming towns, Pembroke, Pearisburg, Narrows, Rich Creek, and Glen Lyn all have public parks to enjoy loop or out and back rides. In the town of Pearisburg you will find ample public parking and residential areas connecting you to the Town Park that also features a one mile River Sculpture Trail. This trail has five permanently installed sculptures created by local and regional artists and made entirely out of debris collected from the New River during the ReNew the New cleanup event. Riders will find Whitt-Riverbend Park just outside of town limits. Parking is available at the Ripplemead Boat Landing, along the New River Water Trail. Restrooms are also available. The park has a paved loop trail and an off-road trail right alongside the New River. Riding from town down to the park is a short 4.5 mile trek, but has a steep grade descending in the park area. In the Village of Newport riders can enjoy access to Route 42, a scenic byway with plenty of parking at the Village Green or Recreation Center. Super Val-U Grocery has Visitor Guides mapping the 30 mile ride to New Castle and back. Swing past the Sinking Covered Bridge on route 601 for a photo and to sign the guest book.